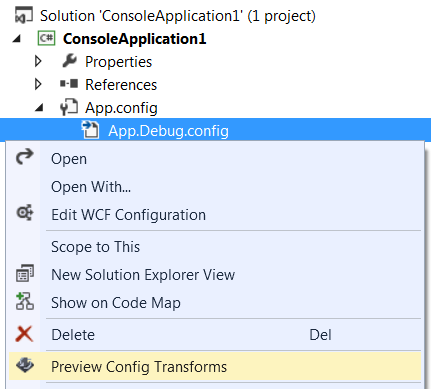 Microsoft has a neat out of the box solution for Web Application Projects configuration transform which gives you the ability to have multiple configurations for each build environment (i.e. web.config). Somehow this ability is not included in other project types. When you have multiple projects with many configurations the dev->staging->production task becomes very unpleasant. I remember back then having one app.config file with different commented configurations for each environment struggling to comment uncomment the right ones. Well I'm happy those days are over. After using app.config transformations for two years doing it the hard way by editing the project file and adding the configuration files manually, I thought it would be nice to write extension to automate this task. There are many articles and solutions out there, some of them used as the inspiration for this extension. Multiple configuration files for different environments (e.g. dev/staging/production). Self-contained solution - no need to install the extension on all dev/ build server machines. Simple few clicks and you are set. Add support for Visual Studio 2017. Add support for Visual Studio 2015. Hot fix for v2.0. Remove 'Microsoft.VisualStudio.Shell.12.0 dependency. Fix linked configs relative path. Add support for source linked configs not included in project. 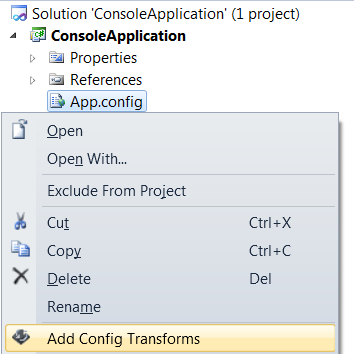 Fix linked configs creation when source config is located in solution sub folder. Add support for Visual Studio 2013. 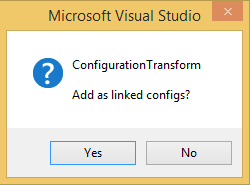 Add support for linked configs transformations. Add deployment(Click-Once) support for class library projects. Fix Visual Studio 2012 compatibility issue. Add support for Visual Studio 2012. Fix typo in xml element.